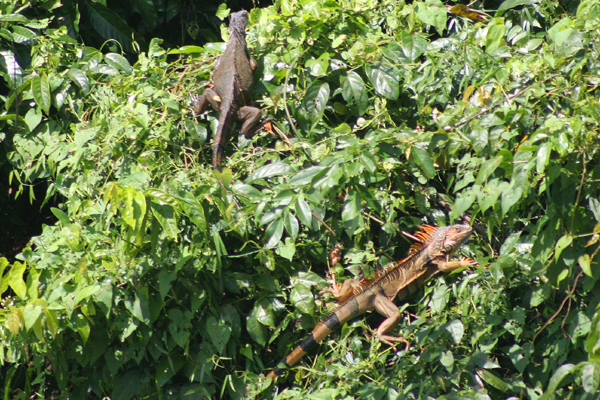 It is not every day that one gets to see a pair of Green Iguanas sunning themselves on a bush from close range. But, as I have already shown in one of my two posts about visiting Cuero y Salado Wildlife Refuge, that is exactly what the boat load of birders I was with got the chance to see way back at the beginning of March. Well, we got to see the iguanas until they both suddenly realized that a whole boatload of people was drifting right up to them at which point they skedaddled, but by that point everyone with camera had already managed several shots and those without had enjoyed great looks that they probably would not ever forget. Now, as a native New Yorker who makes my home in Queens I don’t get to see many lizards. We have just three native species of lizard in New York State (Northern Fence Lizard, Five-lined Skink and Coal Skink) and one introduced species (Italian Wall Lizard). I’ve never seen any of New York State’s lizards (but if you’d like to learn more you can see a PDF of New York State’s lizards here). None of them can come close to being as big or as charismatic as the Green Iguana anyway. 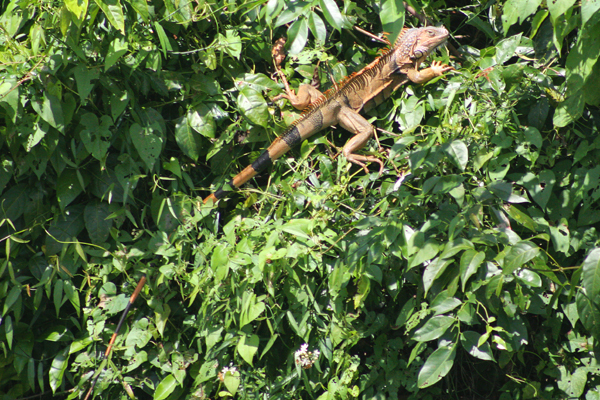 But after having seen Green Iguanas in person my curiosity was piqued, and I figured the least I could do was learn a bit about them and share that information with 10,000 Birds readers…I hope you enjoy! First off, Green Iguana is a bit of a misnomer. Sure, they can be green, but they can be a variety of other colors as well. In fact, the male of the duo that I saw was more of an orange color than anything else, which makes sense because it is the males that are more likely to be a different color. 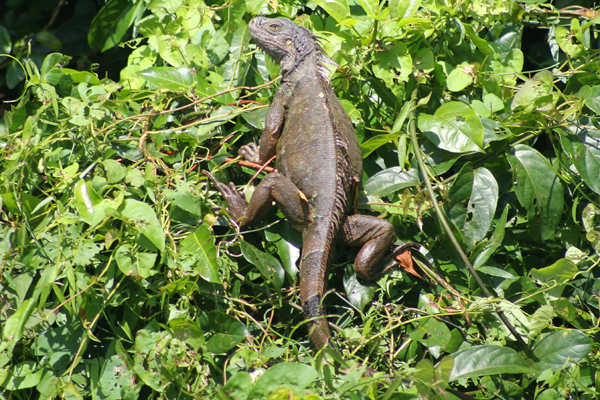 Green Iguanas range from southern Mexico and the Caribbean islands to South America and are relatively common. The biggest threats to their continued survival in the wilderness are habitat destruction and hunting, for both food and for the pet trade (though they are not considered in the least bit endangered). Unfortunately for the Green Iguana, which are known to some who eat them as “bamboo chickens” they are, in addition to apparently being rather tasty, one of the most popular reptile pets in the United States though they are difficult to keep and most die in their first year in captivity. They can grow rather large, over six feet, with some tipping the scales at over twenty pounds, though iguanas that large are the exception rather than the rule. Green Iguanas spend most of their time in the trees but can be found on land and swimming through the water, for which they use their long tail to propel them (one will almost always find Green Iguanas near water). Typically found alone, they will gather together at good sunning spots and during courtship and mating. The female of the species lays ten to thirty eggs in a burrow she digs about 65 days after mating. The eggs hatch sometime between 70 and 120 days later and the young emerge, looking much like they will look as adults, but smaller (though some populations have different-colored young). Young iguanas are omnivores like adults, but are more likely to eat more insects and eggs because of their higher protein needs. I hope that you found the information I’ve provided useful. All of it came from the pages linked to in the text. If you are interested in learning more please feel free to click through the links to find more information about Green Iguanas, which are really fascinating creatures. I hope to see some in the wild again someday! This post was originally published on 12 May 2009. We hate to keep posts this good buried in the archives! Corey if you ever come to Puerto Rico you will most certainly see this species again, as it was introduced here by the pet trade about 30 years ago and is now fairly common at some localities. A beautiful reptile indeed! Great pictures! Iguanas are amazing creatures. I personally have a 6 ft, green iguana that gives kisses. Great site too. My female green iguana has layed 20 eggs so far and is still laying more, is that possible without having a mate all it’s life? I’ve had this iguana since it was a hatchling is this possible? And if so, are the eggs fertilized and can they hatch into iguanas? The following message is in response to Rachel’s question. Green iguanas can lay up to 75 eggs. At least this is what we have reported thus far for Puerto Rican populations. It all depends on the iguanas age and size. Once the female reaches an adult size >25cm in length from tip of nose to tip of cloaca, they may begin to generate eggs in their oviducts. If your female has not had contact with a male, it is improbable that they are viable. I am a biologist currently working with introduced green iguana populations in Puerto Rico. One last thing you can search this information on the internet. There if plenty.